"This is a simple recipe, easy to make. Really nice when you have company over in the morning. Get it ready, pop it in the oven and you have time to socialize while it's cooking! 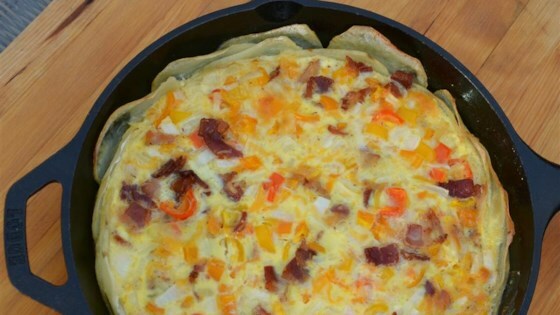 I cut this recipe in half and place it in a pie plate and bake uncovered for 45 minutes for breakfast for a smaller family; it tastes very much like a crustless quiche and my husband loves it! That is how it is shown in the picture." Place bacon in a large skillet and cook over medium-high heat, turning occasionally, until evenly browned, about 10 minutes. Drain bacon slices on paper towels, reserving 1 tablespoon bacon grease. Crumble bacon into pieces. Preheat oven to 350 degrees F (175 degrees C). Grease a 9x13-inch casserole dish with reserved bacon grease. Place milk, eggs, seasoned salt, and black pepper in the bowl of a stand mixer fitted with a paddle attachment. Beat on medium speed until smooth and pale, about 5 minutes. Add bacon pieces, Cheddar cheese, onion, and green bell pepper; beat until combined, about 1 1/2 minutes more. Layer potato slices in the bottom of the casserole dish. Pour egg mixture over potatoes. Arrange sliced mushrooms on top. Cover casserole with aluminum foil. Bake in the preheated oven, about 35 minutes. Remove aluminum foil and bake until eggs are set, about 30 minutes more. Use any color bell pepper you like. I like to use duck eggs but chicken eggs are fine. If you are very sensitive to gluten, make sure you use a gluten-free seasoned salt; some of them have traces of gluten in the mixture. I use my own blend of salt, garlic powder, onion powder, and a little chili powder. So good! Everyone wanted the recipe. I had to use frozen hashbrowns as I didint have any potatoes. Still came out great! Works well w breakfast sausage too. Yum! Will make again! Received lots of compliments...the sliced potatoes on the bottom make it unique. I used 10 eggs and a little over a cup of milk. So good!